This post is dedicated to cookie monster, because...he's awesome. My son will be 1 in July, and I think I want to have a cookie monster birthday party for him. I experimented with some extra cookies and icing I had after making a cookie cake for my brother-in-law. Click HERE to learn how to make a cookie cake. First, color your icing blue, leaving a little white icing to the side for the eyes. I like to use India Tree Natural Decorating Colors, 3 bottles(red,yellow,blue) to avoid using fake dyes. Then, find two cookies that are around the same size. You'll probably want to use a large star tip to pipe the icing. Make a sloping mound, like you see here, on one cookie. Stack the top cookie, so that his face is open. Use a large round tip to pipe the white eyes. Next, put a small cookie in his mouth (you can leave it whole or half it). The last step is to EAT cookie monster. I know it might seem wrong...but he's so good! 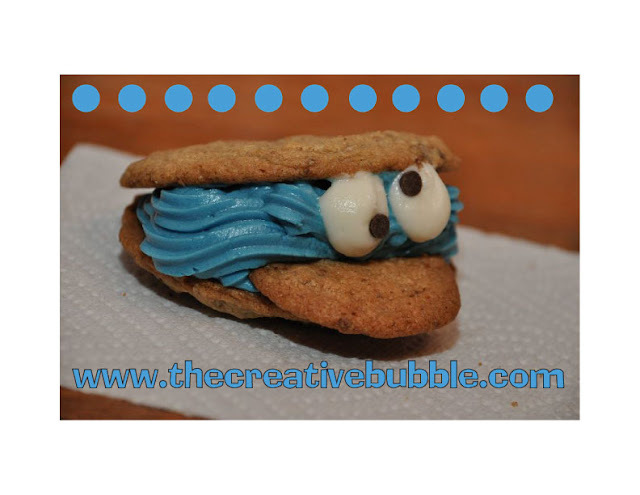 You will want to bake one mini cookie and two larger cookies for each cookie monster.